For high mountain tour lovers with very good mountaineering experience and in excellent health. Island Peak (6.189 m) is one of the most popular climbing peaks in the Everest region, with its impressive glaciated west wall, which rises from the Lhotse Glacier. This tour is designed for experienced and physically fit adventurers who want to experience both trekking and climbing at the same time. 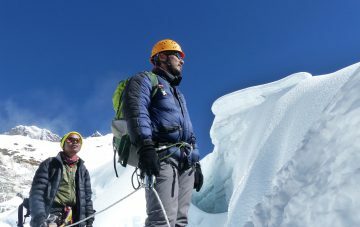 At 6,119 m Lobuche East Peak is one of the highest trekking peaks in Nepal and – as a training summit – is often climbed in preparation for the ascent of Everest. From the summit you have one of the finest mountain panoramas which the Nepal Himalayas have to offer, covering Mt. 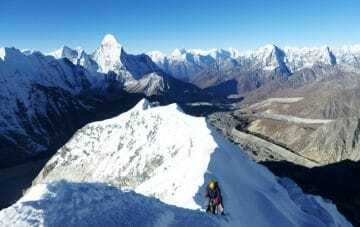 Everest (8,848 m), Cho Oyu (8,201 m), Lothse (8,516 m), Makalu (8,485 m) and numerous other mountain giants, including Ama Dablam (the Matterhorn of the Himalayas). 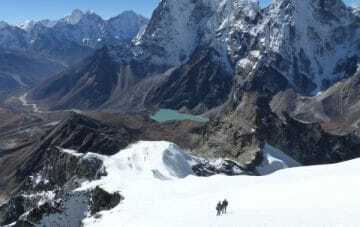 Lobuche East and Island Peak climbing is certainly one of the most intensive 6,000 m peak tours which Nepal has to offer. The adventure begins with an impressive panoramic flight to Lukla. From there the trail leads through river valleys and wooded mountains, up to the glacier-covered heights of the ice giants. Your companions are the imposing peaks of Ama Dablam (6,860 m), Thamserku (6,623 m), Cholatse (6,440 m), Cho Oyu (8,201 m), Lhotse (8,516 m), Makalu (8,485 m), Pumori (7,161 m), Nuptse (7,861 m) and of course the highest of them all, Mount Everest (8,848 m).